There are 20,344 indigenous people in Suriname, which make up about about 3.8% of the entire population. In 2007, Suriname voted in favour of the UN Declaration on the Rights of Indigenous but the legislative system of the country, based on colonial legislation, does not recognize Indigenous or tribal peoples. The country is one of the few in South American that has not ratified ILO Convention 169. The ILO Convention number 169 was held in Geneva in 1989. The ILO is the United Nations’ agency dealing with labour issues around the globe, therefore it’s mainly concerned with gender and discrimination and has a special emphasis on protecting the rights of indigenous people to make sure they can preserve their traditional ways of living, yet hold the same rights and acces to healthcare, infrastructure and education. One of the main issues dealt with by indigenous people all over the world are land rights. In Suriname, the political legislation declares that all land over which property can not be proven, are owned by the government. This means the indigenous of Suriname (Wayana, Arawak, Akurio etc) are in an ongoing struggle to maintain their land and traditional ways. Furthermore, the lack of legal recognition allows individuals, companies and NGOs (including ‘environment’ NGOs) to ask and get land titles in indigenous territory and undertake various kinds of destructive or disruptive activities such as mining, logging, sand extraction, building infrastructure, etc. without the consent of the affected communities, and disrupting ecosystems and social and cultural patterns. Most important ecosystem in Suriname is situated at the North Eastern coast and Lower district of Marowijne. This also, not surprisingly, happens to be the homeland to most of Suriname’s indigenous communities, like the Kaliña and Lokono peoples, but also many bird species and rare leatherback sea turtles as well as many other wildlife. For many years, the state has given out permits to mining companies to settle in the region without ever asking for consent, leaving many indigenous people, plants and species at risk of intoxication and loosing their homes. First official complaints were filed in 2007, handed over by the Inter American Commission for Human Rights. March 2016, the international Court finally ruled in favor of these complaints, which is a big win for indigenous rights within the country. It’s a decision that has no precedent and many implications in a country where there has been a big boom in bauxite and gold mining in recent years. The Court demanded that Kaliña and Lokono territory would be marked and titled, and that formal processes to decide on restitution of lands affected by third parties and the nature reserves all happen within three years. The court also ordered Suriname to rehabilitate the serious damage caused by the bauxite mining done by subsidiaries without any permission of the Kaliña and Lokono peoples and without having done any form of impact assessment. 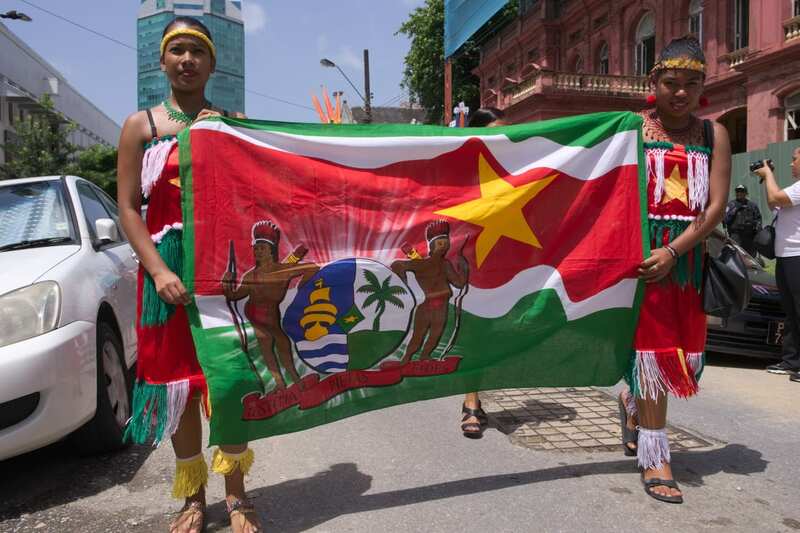 Lastly, the state was ordered to implement a series of guarantees of non-repetition, requiring the legal recognition of indigenous territories and other rights of all indigenous and tribal peoples in Suriname so that history is not repeated again. What an amazing win! So how is the lower Marowijne doing 2 years after the fact? Earlier this year, the Forest Peoples Program went into the heart of the Marowijne district to determine the actual damage and how to restore sights previously cultivated by the mining industry. The mission was also joined by the local Association of Indigenous Village Leaders, and the action plan will restore forest and savannah ecosystems so communities can again benefit from this area of their territory. The joined endeavor of both local indgenous elders and experts of biodiversity is intended to restore the ecosystems the way they used to be and can best benefit the livelihood of both Kaliña and Lokono people. This might take some time, but is actively monitored by the IACHR.